Local fashion podcaster Betsy Blodgett (left) and KCPT's community engagement producer, Lindsey Foat, model costumes in the Lyric Opera of Kansas City's upcoming sale. Granted, people tend to think about dressing up this time of year. But even those who don't normally consider donning Cleopatra’s headdress, waltzing in Cinderella’s ball gown or vamping like a starlet might find something they need at the Lyric Opera of Kansas City Opera Costume Sale. It's also a chance for opera fans to take home a piece of theater history on Saturday, when the company sells hundreds of decommissioned costumes from productions like "Aida," "Giulio Cesare," "The Magic Flute," "John Brown," and "I Capuleti e i Montecchi." Deborah Sandler, the Lyric's general director, says the diverse array of costumes, headdresses, gowns, wigs, suits and shoes offers something special for everyone. Foat wears a lush velvet robe and Blodgett poses in an aqua, 1930s-style silk dress. One highlight of the sale is a lavender, fur-lined dress worn by Joyce DiDonato during the 2004 production of "La Cenerentola," Rossini’s opera of the tale of Cinderella. Whoever purchases this gown will also receive an autographed photo of DiDonato wearing the dress onstage. Sandler says it is routine for opera companies to sell off old costumes, but the Lyric hasn't opened its theatrical wardrobe to the public since a rummage sale before the company moved to its new home in the East Crossroads in 2012. “There’s tons of stuff in here,” says Sarah Zsohar, the Lyric's artist services manager, who is in charge of organizing the sale. Prices start at $3 and run up to $1,500 for a pristine silk wedding dress from the 1930s. A rack of decommissioned costumes represents a small sample of the hundreds of items for sale later this month. “I think people should wear vintage clothes all the time,” says local fashion podcaster Betsy Blodgett, who agreed to help model some of the wares for KCUR's photo shoot at the Richard J. Stern Opera Center. Blodgett, who hosts the makers podcast Hello Atelier, says she likes to incorporate costume-like elements into everyday attire. Also modeling, on her lunch break from KCPT where she works as a community engagement producer, is Lindsey Foat. Blodgett (left) lights up an electric blue and purple dress, while Foat masquerades in a feathered carnival mask. Civil War re-enactors, meanwhile, might find interesting props and costumes from the 2008 world premiere of Kirke Mechem's "John Brown." Even Sandler says she’s taken a turn in the dressing room. Or you could just make your regular wardrobe really sing, Zsohar says. 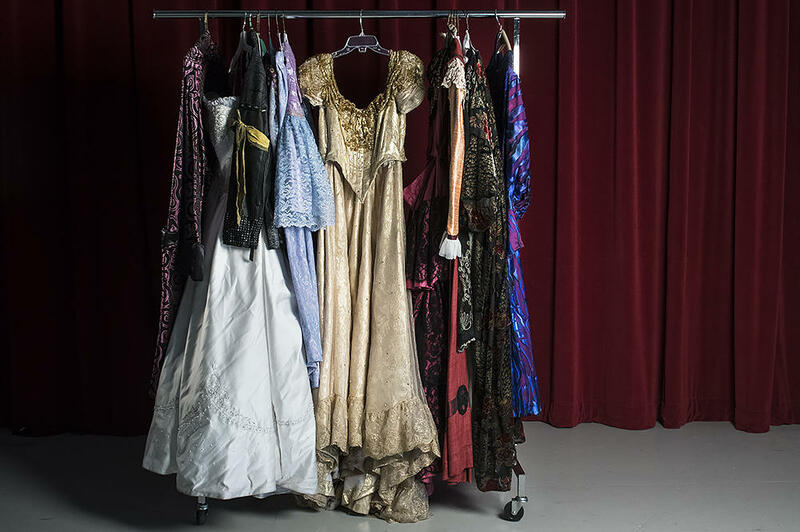 The Lyric Opera of Kansas City Costume Sale, 9 a.m.-4 p.m. Saturday, October 14, at the Richard J. Stern Opera Center, 712 East 18th Street, Kansas City, Missouri, 64108. The curtain rises this weekend on Georges Bizet’s Carmen, the Lyric Opera of Kansas City’s final production of the season. 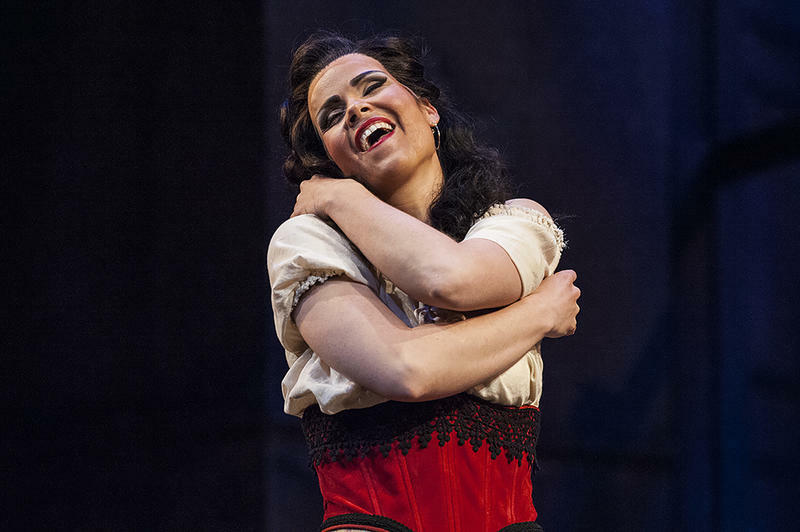 At the heart of this story of love, betrayal and revenge is Carmen, the tempestuous Gypsy played by Latvian mezzo-soprano Zanda Švēde. The grand spectacle of opera is an expensive art form. These days more and more opera companies are banding together to ease the financial burden. For the first time in its history, Lyric Opera of Kansas City is taking the lead in a new co-production. Most people are familiar with Dead Man Walking, the book and movie that's based on Sister Helen Prejean's interaction with a death row inmate. Well, there's also an opera that's inspired by her story. We talk to some people from the Lyric Opera about their upcoming performance of this contemporary American work ... and the community outreach they've planned around it.